Darwinists teach that nature is just a gladiatorial arena of cutthroat competition and selfish struggle—a conquer-or-be-conquered “survival of the fittest” contest. They routinely skew their caricature of nature to overemphasize its brutal death struggle as if death were some sort of good, driving life force. But how should a Christian view nature? Scripture teaches that creation is seriously fallen.1 However, creation retains much of its created goodness and harmony, even while “groaning” with entropy and mortality. If we look carefully, the original neighborliness of nature is still easy to see. Creation retains much of its created goodness and harmony, even while “groaning” with entropy and mortality. Yet saguaro cacti, helpful and generous as they are to their neighbors, also receive vital benefits from them, illustrating the symbiotic dynamics of America’s southwestern deserts. 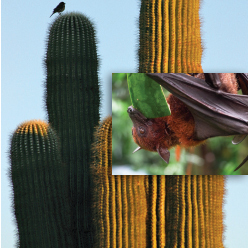 Bats provide pollinating services in deserts and elsewhere while acquiring nectar from cactus flower blossoms. Insectivorous bats consume crop-pest bugs. Fruit-eating (frugivorous) bats provide yet another plant-helping service: far-flung seed dispersal. Fruit-eating bats are one of several animals that consume ripe fruits without destroying seeds. Their post-digestion droppings facilitate seed dispersal and enhance the seedlings’ well-being.3 For example, in Africa’s Ivory Coast bats digestively “plant” fruit seeds. Birds, rodents, and simians do the same—sometimes at locations quite distant from the fruit-producing parent trees. However, research shows that seed-sowing birds routinely avoid open areas, preferring the safety of trees, so 95% of the fig seeds dropped in open areas come from fig-eating bats.3 Frugivorous bats drop a lot of seeds. They deposit twice their weight each night, in flight, due to their rapid digestive systems. That’s a lot of fertilized seed droppings! As you exchange gifts with loved ones this Christmas, many of God’s creatures and plants will be exchanging gifts, too. The saguaro cactus and tropical bat are only two examples of mutually beneficial relationships found in Earth’s ecosystems. But community mutual aid abounds all over the natural world, even in habitats as different as deserts and jungles. So, as you exchange gifts with loved ones this Christmas, many of God’s creatures and plants will be exchanging gifts, too. Genesis 3; Romans 8:18-23; Psalm 104. Kricher, J. C. 1993. A Field Guide to Ecology of Western Forests. Boston: Houghton Mifflin, 279-280. Tuttle, M. 2015. The Secret Lives of Bats. Boston: Houghton Mifflin, 135-136 (bats pollinating Sonoran Desert cacti), 222-223 (fig-eating bats dispersing seeds in Lamto, Ivory Coast). See also Reshetiloff, K. 2017. We Must Protect Bats as If Our Lives Rely on Each Other, Because They Do. Chesapeake Bay Journal. 26 (7): 40. Cite this article: James J. S. Johnson, J.D., Th.D. 2017. Cactus, Bats, and Christmas Gift-Giving. Acts & Facts. 46 (12).